Agile and stable on the surface of the water, and rapid and fluid in the air, the AKOYA’s high performance is due to its “Seafoils”. The AKOYA’s highly characteristic “Seafoils” resolved an issue that was an a priori insoluble problem: how could an amphibious plane be designed without compromising its flight performances? The solution was triggered by observing racing yachts and, specifically, the Hydroptère sailboat, a project initiated by Eric Tabarly and continued by Alain Thébault. This yacht, fitted with hydrofoils, a veritable “flying” boat, managed to break speed records in the 2000s using this technology. Over recent years, almost as a confirmation of our decisions, we have been witnessing a real increase in the use of hydrofoils; for example, in the yachting milieu, with the creation in 2012 of the AC72 catamarans for the Coupe Louis Vuitton and the America’s Cup, and in board sports: kitesurfing, windsurfing, paddling, surfing, and so on. The reputation of foils has been firmly established in the world of sailing. The “Seafoils” are following the same path and have opened up a whole new era in aeronautics. The concept had been found: to fit the fuselage with “ailerons” that have a similar profile to the wing of an airplane and which are supported by the water to raise the fuselage. More specifically, it involves eliminating the suction effect of the water on the fuselage, by creating lift thanks to the flow of the water over these sea wings, as the airplane increases its speed. This technology means that the airplane can be designed without the traditional hull shape and step of amphibious aircraft, that, despite being relatively effective on the water’s surface, they generate drag in flight, which negatively affects the airplane’s performance. The “Seafoils” are an excellent example of this LISA precept. On the racing boats, the hydrofoils are mobile and require complex maneuvers. LISA wished to eradicate difficult flight operations and opted for a configuration of fixed foils in an inverted “V.” This self-stabilizing configuration, which requires no maneuvers, was ideal for aviation applications, but unfortunately had never been tested. It took ten years of research and development, the testing of hundreds of configurations and profiles, and a healthy dose of determination and ingenuity to find the right formula. The fixed and self-stabilizing profile of the “Seafoils” means that the pilot can dispense with the often tricky maneuvers that involve positioning the airplane using step taxiing just before take-off. 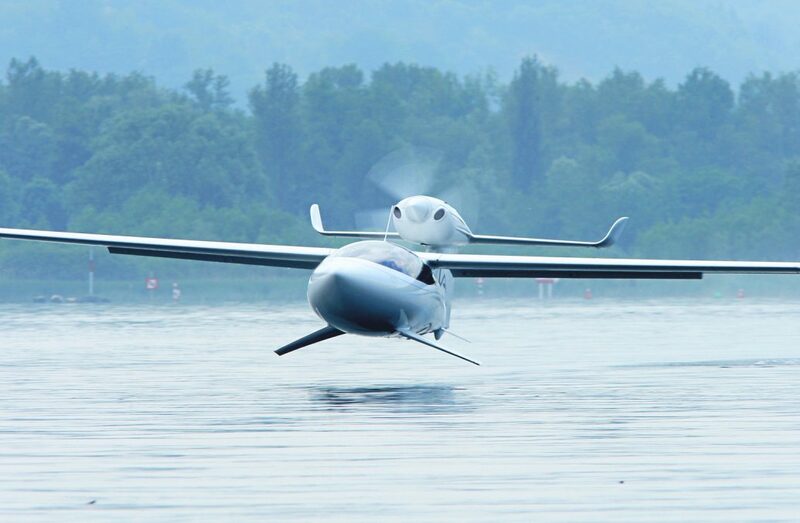 As the airplane accelerates, they lift and adjust the airplane’s position without requiring any specific action, making the flying of the seaplane far simpler and safer. Likewise, their profile corrects small flying errors by automatically repositioning the airplane in a balanced position, on two or three points, thereby avoiding any risk of the plane plowing into the water. All of the taxiing phases are also more confortable. As the fuselage is no longer in contact with the surface of the water, the “Seafoils” buffer the choppiness of the waves, so that the passengers in the cockpit feel as though they are “surfing” over the waves. Though designed for the water, the “Seafoils” come into their own in the air. Shaped like wings, they produce almost no drag during flight. The motion of the aerodynamic fuselage is not constrained by any equipment or “hydro” shape. The aircraft’s performance is therefore considerably improved, both in terms of speed and range.